Casino Technology launches new cutting-edge product offerings at ICE 2019. Celebrating its 20th anniversary this year, the company will make a spectacular premiere of the latest releases of slot machines with diverse content at stand N5-140. Rossi McKee, Vice President of Casino Technology commented: “The new offerings include eye-catching cabinets with fascinating new multi games. The quality line-up of leading-edge technology and a brand-new content for truly exciting experience is defying our participation at 2019 ICE edition”. The successful award-winning series of EZ MODULO™ slot machines were further extended with high end models – EZ MODULO Titan™ and EZ MODULO Tower™ that make the product line a perfect choice for all types of casinos and gaming halls. The innovative EZ MODULO Titan™ captures the player’s attention with compelling design. Featuring 32” UHD main monitor and an impressive 43” UHD J-curved monitor for displaying the jackpot accumulations and the winning celebrations, the cabinet offers superior ergonomics and improved players comfort. The machine could be offered with 13″ button deck, which combined with a black chrome finish gives a new sense of sophisticated style and design. 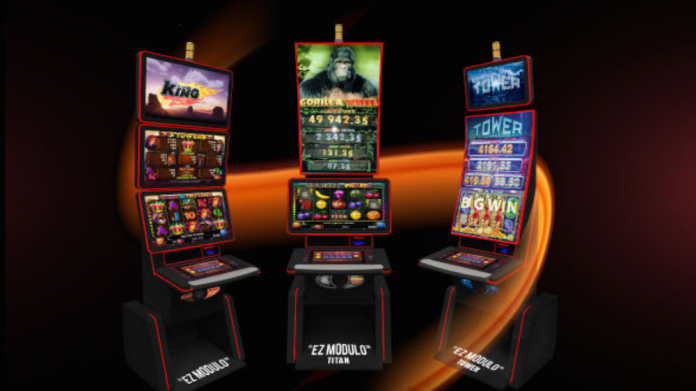 EZ MODULO TITAN™ is offered with GORILLA WHEEL™ – a multi level progressive game suite with 12 titles and SPEED KING™ multi game with up to 60 games. The next new release is EZ MODULO TOWER™. With unique 43-inch J-curved monitor and full touchscreen capabilities, the cabinet offers crystal clear sound, and edge lighting as well as a 27” topper. EZ MODULO TOWER™ will be available with TOWER™ 102 fruits and TOWER™ 104 multi games. Both consisting of 40 titles, the game packages provide attractive winning combinations for extra thrill, with extra wins in addition to the standard winning lines, such as the whole screen filled with the same symbol and interactive bonus features. EZ MODULO™ series are presented in another new modification with three 32” HD monitors, featuring the SPEED KING™ multi game. SPEED KING™ provides an exceptional gaming experience with 60 titles, carefully selected after profound research on the market needs. The multi game has realistic graphics, high quality sound, great effects and efficient set of intriguing game maths.